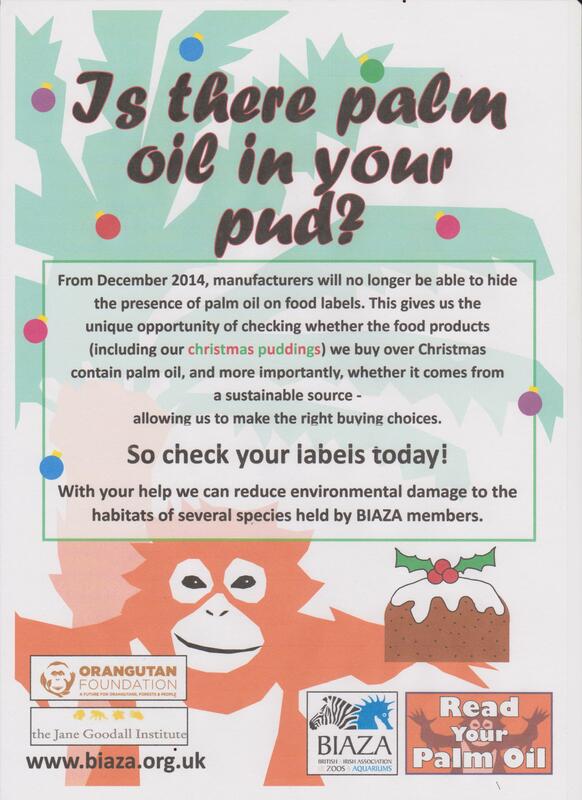 Old Macdonald is joining with his friends in other Zoos to encourage Shoppers to read the label when buying their Christmas pudding this year in a bid to save species, like the orangutan, from extinction. From tomorrow (December 13), new labelling laws will mean food products must state the source of any oil or fat ingredient including palm oil, the production of which had led to the destruction of habitats of orangutans and many other endangered species. 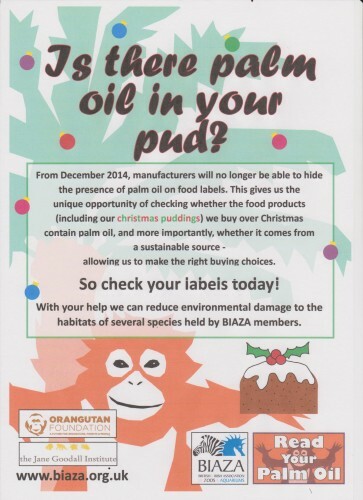 In light of these changes, the British and Irish Association of Zoos and Aquariums (BIAZA) is working with The Jane Goodall Institute, The Orangutan Foundation and its 108 members to raise awareness of the importance of carefully considering ingredients in a product before purchase. Orangutan numbers are declining rapidly with fewer than 54, 000 of the Bornean orang-utan and fewer than 7,300 Sumatran orangutans left in the wild. The UN declared the plight of these animals a conservation emergency and understanding the debate is a first step to addressing it. Shoppers now need to decide whether to boycott food products with palm oil completely or choose products only containing certified sustainable palm oil. By boycotting completely we risk shifting oil consumption to less productive oils such as soya which would use seven times more land space per tonne; however with sustainable palm oil there are doubts over robustness and full traceability. Credible certification is essential and it would be a significant achievement if the UK can ensure that only 100% sustainable palm oil is imported by 2015. To help shoppers over the Christmas period, BIAZA scoured the web for the best and most sustainable Christmas puddings and came up with our Top 5. We have included the most highly rated puddings, while looking at the procurement guidelines for each store. All these puddings contain palm oil; however Co-op, Waitrose and M&S are leading the way for supermarkets in terms of sustainability. BIAZA’s Palm Oil subgroup has also produced palm oil procurement guidelines and its member zoos and aquariums are reviewing their policies to see how we can be more sustainable. As well as raising awareness amongst visitors, some have even produced new palm oil free recipes for their own Christmas puddings. Also, Old Macdonald wants shoppers to know that if they want to buy him a present he is not too proud to accept it! Well, he can only ask. This entry was posted on Friday, December 12th, 2014 at 12:24 AM	and is filed under Educational Farm News. You can follow any responses to this entry through the RSS 2.0 feed. You can leave a response, or trackback from your own site.